There has been a lot of activity vis-à-vis the Middle East since we last posted our weekly digest. We appreciate your patience and would like to present the most compelling stories at long last. On Monday, the Philippine government banned its citizens from traveling to work in Kuwait and began the repatriation of more than 10,000 Filipinos already there. The Filipinos have a long history of mistreatment and working under inhuman conditions in the Middle East. The matter received great attention again since the body of Joanna Daniela Demafelis, a Filipino housemaid, was found last week inside a freezer in an apartment in Kuwait that had been abandoned by her employers in 2016. On Tuesday, as an allied partner to the United States promoting collective Western values and interests, French President Emmanuel Macron said from Paris that recent reports of increased Syrian government use of chlorine bombs against civilians is a “red line” for France. This was followed with threats that France is ready to strike locations of origin when known where the bombs were made as well as where they were launched. To no surprise, the allied Syrian and Russian governments deny such allegations of chlorine bombs used against civilians and claim the reports to be fabricated. Regardless, there remains a close watch on the Syrian regime by the United States, France and other allies to ensure civilians human rights are protected. Also on Tuesday, Israeli police recommended that Prime Minister Benjamin Netanyahu be indicted on bribery and breach of trust charges in a pair of corruption cases, dealing an embarrassing blow that is likely to fuel calls for him to step down. Netanyahu angrily rejected the accusations, which included accepting nearly $300,000 in gifts from a pair of billionaires. He accused police of being on a witch hunt, vowed to remain in office and even seek re-election. The recommendations now go to the attorney general, a Netanyahu appointee, who will review the material before deciding whether to file charges. Netanyahu can remain in office during that process, which could drag on for months. 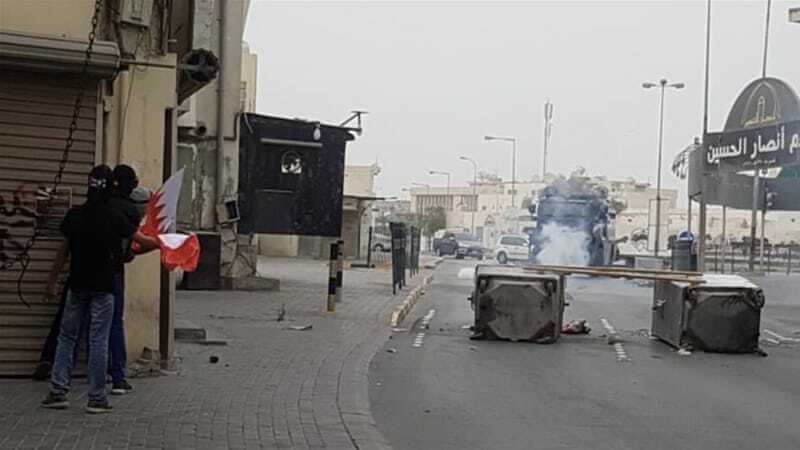 On Wednesday, Bahrain’s security forces clashed with protesters marking the seventh anniversary of the February 14th uprising. Tensions have been running high in the kingdom for years, with a growing sectarian divide and gap between the majority Shia population and the island’s minority ruling Sunni government. Also on Wednesday, Kuwait, Qatar, Saudi Arabia, Turkey and several non-state actors, including the EU, promised to fund rebuilding in Iraq. After the three-day, donor conference in Kuwait, donors have pledged 30 billion dollars to help Iraq rebuild after the four-year war against ISIL that has left the country in ruins. The pledge fell well short of the $88.2 billion Baghdad is seeking. The biggest pledge at the gathering in Kuwait came from Turkey, which announced $5 bln in credit to Iraq, while Kuwait’s ruling emir said his oil-rich nation will give one billion dollars in loans and one billion dollars in direct investments. Although the United States said it was extending a $3 billion credit line to Iraq, it has not provided any direct government assistance. It instead hoped it could count largely on Gulf allies to shoulder the burden of rebuilding Iraq. On Thursday, Brett McGurk, the US Special Presidential Envoy to Global Coalition Against Daesh, met with His Highness Sheikh Mohamed bin Zayed Al Nahyan, Crown Prince of Abu Dhabi and Deputy Supreme Commander of the UAE Armed Forces, at the Louvre in Abu Dhabi to discuss the ongoing joint efforts to combat terrorism and extremism. Also on Thursday, more bilateral conversations took place, this time in Turkey: U.S. Secretary of State Rex Tillerson and Turkey’s Tayyip Erdogan had a “productive and open” talk about improving ties strained recently over their policies on Syria, in a meeting following weeks of escalating anti-American rhetoric from Ankara. Tillerson arrived in Turkey on Thursday for two days of what officials have said would likely be uncomfortable discussions between the allies, whose relations have frayed over a number of issues, particularly U.S. support for the Syrian Kurdish YPG militia, seen as terrorists by Turkey. On Friday, Tillerson met with Turkish Foreign Minister for further rapprochement. At a joint press conference with Mevlut Cavusoglu, Tillerson said “We are not going to act alone any longer, not the US doing one thing, Turkey doing another. We will work together … we have good mechanisms on how we can achieve this, there is a lot of work to be done.” Cavusoglu said that the NATO partners had “agreed on normalizing relations again,” and commented that Washington-Ankara ties were at a “critical phase.” At issue has been Turkey’s decision to launch an air and ground assault last month in Syria’s northwest Afrin region to drive the YPG from the area south of its border. Ankara considers the YPG to be an arm of the PKK, a banned group that has waged a decades-long insurgency in Turkey. The militia is the main ground element of the Syrian Democratic Forces (SDF), which the United States has armed, trained and aided with air support and special forces to fight Islamic State. To wrap up on a pleasant note, plucky Morocco continues to garner attention for its bid to host the 2026 World Cup (soccer) games. Prime Minister Saad Eddine El Othmani proclaimed that the Moroccan government is fully mobilized to support the Morocco’s bid while Rachid Talbi Alami, Morocco’s Minister of Sports and Youth, said the kingdom is planning to build six 40,000-seat stadiums, in addition to a seventh 100,000-seat stadium in Casablanca. The new stadiums will be in addition to five stadiums already in existence in the country. Two others are now being built in Tetouan and Oujda. Elsewhere on the soccer front, the United Arab Emirates fined a second player in a week for ‘unethical hair’. Brazilian midfielder Caio (below right), who plays for UAE team Al Ain, was fined AED1,000 ($272) by the UAE FA’s disciplinary committee for his hairstyle. Moroccan Mourad Batna (below left), another club player in the Emirates, previously received a similarly hefty fine for the same offense. Fashion-forward footballers are unlikely to be deterred by such efforts to cramp their unique styles.